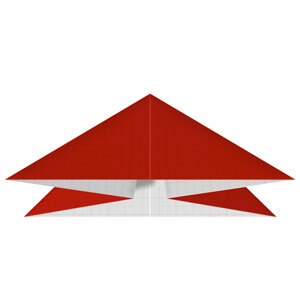 This page is for those who want the instructions to apply a balloon-fold in origami. 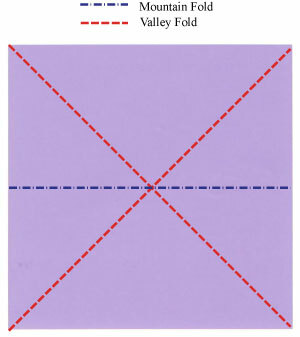 Balloon-fold consists of two diagonal valley-folds and one horizontal mountain-fold. This technique is usually used to make a base called a balloon base. 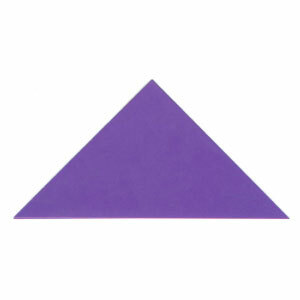 The "balloon-fold" symbol is represented by two valley-folded and one mountain-folded lines. If we apply "balloon-fold", then a square paper will be turned into a "balloon base" . In the next page, the instruction will show how to apply the balloon-fold in detail.